We are on a continuous quest to find a very special kind of person. Well we are looking for several of you ! IN BRIEF: the person will run our food stall - for 1 day - at an artisan food event within a radius of 100 miles of Sheffield. Food enthusiasts based in or near Sheffield to help us grow the appeal of our food in the middle third of England. Those who join us will be passionate about being part of creating the next big cuisine in the U.K.
You will pick up everything you need on the day from our Sheffield city centre HQ - and then you drive off to the event, e.g. farmers market, set up and sell our food (after paid training) and will return everything back to the HQ at the end. To undertake this role you will need to be a driver, with a full British and clean licence PLUS an owner of a hatchback style car or small van. You talk confidently, and laugh. You speak English well. You are willing to learn from us so as to give yourself the best chance of selling increasing volumes of our food - as well as telling us some smart ways we could encourage purchases. You are likely to have experience in a quality food, retail or restaurant environment - or - if not that, a demonstrable enthusiasm for good food. You will be comfortable in coping with a busy and sometimes stressful customer-facing role, and cheerfully serving - for 4 to 8 hours at an event. Tasks include receiving from us our chill-boxed food and stall equipment, setting it up, following our 5 star rated hygiene standards to sell our produce, taking payment from customers, offering advice and information to our customers, safely packing unsold food/equipment for return to HQ at the end of the event. The cycle concludes with completing appropriate financial paperwork. The typical day starts around 6.00am and finishes around 5pm. We will meet you at our HQ and collect everything and make payment for your hours worked. Your venues will generally be within a radius of 100 miles from Sheffield. We would like your help on a once-a-week or once-a-fortnight or once-a-month basis OR any combination of those ! 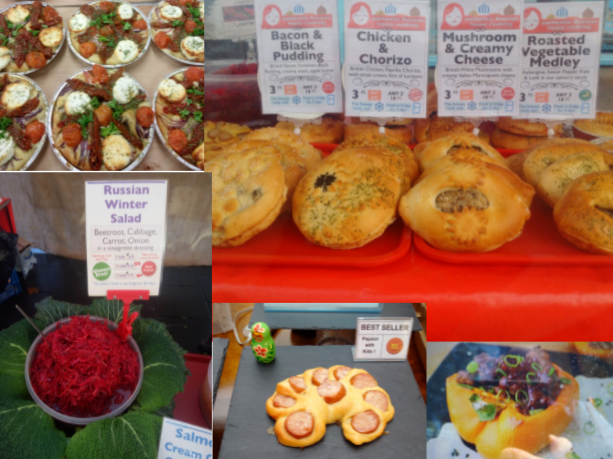 The typical adult rate of pay for working on a stall at a farmers market plus a discount on our highly praised food. An incredible fun but frantic working environment selling some of the most interesting food you will have ever seen and tasted. We have won all the top awards at the British Pie Awards and The Great Taste Awards - plus many other national awards too.